Slash oil output to boost revenues but risk deepening the world's economic woes? Rarely have OPEC oil ministers faced a tougher choice. The Organization of the Petroleum Exporting Countries meets in Vienna Sunday, where they could reduce daily production by up to half a million barrels, or do nothing. OPEC meetings are usually more clear cut. If oil ministers of the 12-nation organization think prices are too low, they decide to crimp output - as they have at the last two meetings. If oil is too pricey, as was the case less than a year ago, they boost production. And if they are happy, they keep to the status quo. But desperate times call for more finessed decisions. This time, the ministers want to bolster prices. While prices are off their low of around $30 just a few weeks ago, a barrel of crude still fetches less than a third of what it did over the summer. That is well below the break-even point for producing nations, which could affect not only their national budgets, but oil production as well. "Prices have actually been very stable and haven't dropped to the lows we've seen in the last 90 days or so, but if they want to fortify prices, they probably need to cut production further," Tom Kloza, of Oil Price Information Service, told CBS News. Two reports published Friday were expected to support traditional OPEC hard-liners such as Venezuela in their arguments that a further output cut is needed. At the same time, they served as an indirect warning - drive up prices more and face even less demand in a sputtering global economy that already has cut back on consumption. Kloza said OPEC is in a very bad spot. "It would be unthinkable that anything can happen at this meeting that would lead to major sort of move in fuel prices, at least the kind of jolts we became accustomed to from 2005 to 2008," Kloza said. "This isn't the year for it. The world is broke and it's not using energy." The OPEC meeting comes as the world takes at least a breather from the usual relentless slew of bad news since the financial crisis became most acute last October. The down Dow Jones industrial average is up around 10 percent and most Asian and European markets also are climbing. Perceptions of how OPEC acts could affect global equity markets. Some OPEC ministers are calling for cuts, nonetheless. "If we do not reduce, prices will fall," Algerian Energy and Mining Minister Chakib Khelil said Wednesday, saying OPEC viewed $75 a barrel as a fair price both for consumers and producers. But continued concern about the world economy - and apparent pressure within OPEC from oil powerhouse Saudi Arabia to eliminate overproduction by individual members such as Iran and Venezuela - suggest the ministers might opt for a small, symbolic cutback; or perhaps none at all. A relatively strong comeback in prices may help the Saudis and other Gulf producers make their case. Prices have rallied from below $35 a barrel last month. Benchmark crude for April delivery fell 42 cents to $46.61 a barrel on the New York Mercantile Exchange. 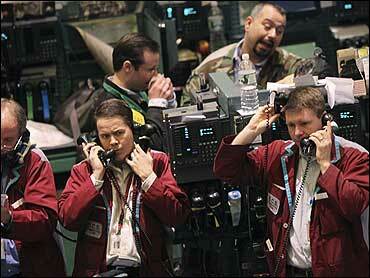 In London, Brent prices gained 35 cents to $45.44 on the ICE Futures exchange.